Dr. Troy Reiner is the Director of Word of Life Counseling Training Institute and the Faith Therapy Christian counseling training program. For more free videos and low-cost certifications and college degrees from Logos University, you can go directly to his websites: freechristiancounselingtraining.com and faiththerapy.org. Faith Therapy is a new methodology for in-depth Christian Counseling and life coaching derived directly from the Bible and based on the process of salvation by faith.God's method of salvation works! It is our job as counselors and life coaches to assist the Holy Spirit, the chief counselor, by removing the roadblocks to the process of salvation in order to help God's people achieve the wonderful, fulfilled life that God intended them to have. Faith Therapy is a ministry outreach developed by Dr. Troy D. Reiner. He has graciously granted us permission to offer it here free of charge. You work at your own pace from the comfort of your home anywhere in the world. If you would like to receive certification or degrees, contact Word of Life Counseling Training Institute directly and register with them online. Faith Therapy is a biblically derived and integrated method for psychological healing and spiritual growth based on the process of salvation by faith. Biblical models, principles and methods are used to identify the root cause of a problem, remove any hindrance to spiritual growth and develop the faith necessary to overcome the problem. 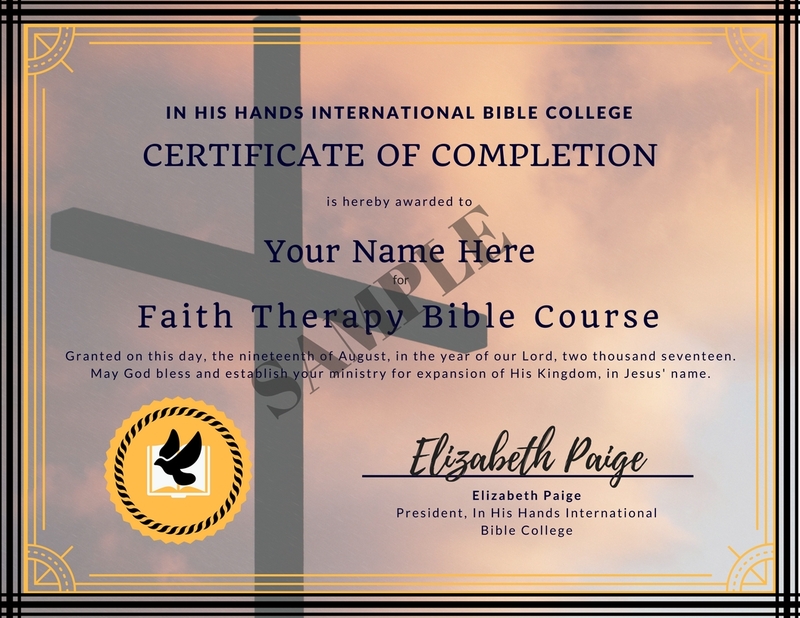 Faith Therapy Curriculum was developed over a period of years based on the Faith Therapy methodology but expanded to cover all of the most important topics commonly encountered in the church counseling and life coaching environment. It provides both self-help resources for individuals and college curriculum for effectively training Christian counselors and Bible-based life coaches. Not only has this curriculum proven to be very easy to teach and implement in churches, but it has proven to be an extremely effective and appropriate means of evangelism in this culture and may be applicable as missions in other cultures. All of our methodology directly includes evangelism since without salvation by faith the best that counseling can do is make more effective participants for the rat race of life and does nothing to prepare them for eternity. In order to fill the gap between a more superficial application of biblical verses and the more in-depth therapy which has relied heavily on secular counseling theory and methods, Faith Therapy was developed during the last 15 years. It began with an attempt to understand how the process of salvation or wholeness was achieved by faith in God. As this revelation began to unfold through the story of Abraham, the father of faith, it led to a widening understanding of additional models, principles and methods that effectively dealt with more and more deeply rooted complex psychological problems. The tenants of Faith Therapy were derived directly from the Bible, as God provided greater insights over a period of years. Biblical models, principles and methods are now used to identify the root cause of a problem, remove any hindrance to spiritual growth and develop the faith necessary to overcome the problem. How is Faith Therapy Biblically Integrated? Faith Therapy is biblically integrated, because it has been derived directly from the Bible and embraces all aspects and doctrines of the Bible as a whole. It attempts to integrate all the principles of the Bible into a coherent, holistic approach for healing the entire person, including mind, will, emotions and spirit. In dealing with complex problems, it uses a narrative approach because it relies heavily on a biblical world-view and a study of numerous biblical narrative stories, using a types and shadows interpretation of the Bible. These narratives provide the advanced biblical principles and psychological truth that serve as strategies for therapy or healing. Faith Therapy focuses on dealing with the root cause, which is a lack of faith, not just the symptoms of the problem. It also addresses the overall growth of psychological and spiritual wholeness over the life span of the client. It suggests that the overall orchestration of the process of healing is the job of the Holy Spirit and that the counselor is enlisted for a limited time to address specific blockages in the process of salvation. How are Counseling and Life Coaching Different? Although Bible-based coaching is probably a subset of counseling, counseling as a whole is focused primarily on dealing with relationship problems, helping clients overcome significant psychological obstacles, or conquering besetting sins which make living a successful Christian life impossible. Bible-based coaching focuses on helping people who have already experienced some success in their Christian lives, who have a reasonable knowledge of the Bible, and who have a deep desire to become all that God has called them to be. Although Bible-based coaching is probably a subset of counseling, counseling as a whole is focused primarily on dealing with relationship problems, helping clients overcome significant psychological obstacles, or conquering besetting sins which make living a successful Christian life impossible. Bible-based coaching focuses on helping people who have already experienced some success in their Christian lives, who have a reasonable knowledge of the Bible, and who have a deep desire to become all that God has called them to be. Bible-based coaches provide assistance in spiritual growth, the development of Christian character, determining a specific calling, and helping clients accomplish what God has called them to do in this life as effectively and successfully as possible. Bible-based coaches are trained, experienced, reasonably mature Christians who personally mentor others in their Christian life helping them to determine God’s direction for their life, praying for them, and taking a personal interest in their success in running their race on this earth. What Makes Faith Therapy Unique? Faith Therapy is unique in that it is based solely on the process of biblical salvation by faith. After determining the root problem and helping the client to realize that he cannot resolve it without God, the most fundamental step in the healing process is leading the client to accept Christ as his Lord and Savior. Once Christ has been accepted, the Holy Spirit orchestrates the process of salvation or wholeness. The Christian counselor’s job is to help the client remove any roadblocks to this process and assist him to grow in Christian maturity once the roadblocks are removed. In addition to bringing relief to the presenting problem, faith therapy views all problems as symptoms of deeper life issues, which are rooted in a lack of faith in God to meet the client’s most basic needs. Bible principles and models are used for the overall direction of therapy to overcome the original presenting problem, since relying on God’s Word builds faith in God—the ultimate answer. These models focus directly on areas where faith is needed to overcome a particular psychological or spiritual vulnerability. In this process, numerous methods, ministries and counseling modalities are applied: preaching, teaching, intercession, prayer, worship, discipleship, confrontation, deliverance, compassion, insight therapy, faith healing, the gifts of the Spirit, prophetic ministry, Theophostic Prayer Ministry, mentoring, support groups, supportive relationships and many others. Faith Therapy is best applied within a dynamic body of believers in a local Church, where faith is taught and put into practice on a daily basis. Faith Therapy, as it is applied to Bible-based life coaching, is also unique because it was derived directly from the Bible based on a number of stories about discipleship. It, therefore, provides a uniquely Biblical methodology for life coaching. On What Psychological Model is Faith Therapy Based? As I have already stated a number of times, Faith Therapy has been derived directly from the Bible. Therefore, this question really becomes, “What is the basic psychological model on which the Bible is based?” According to the Bible the basis of most psychological problems is sin or “missing the mark.” In fact, it was the sin of Adam and Eve that is responsible for all sickness and pain in the world. If we accept the fact that, as a minimum, sin is the basis of at least all psychological problems that result from our free choices, then what is the basis of sin? It is based on our free choice to try to direct our own lives in order to meet our needs without God. Each of us is driven to meet our most fundamental psychological needs of the self: love, security, worth and significance. Attempting to meet these needs of the self, in our own strength, is called self-centeredness or selfishness, and it lies at the core of our sin nature. These needs provide the motivation for everything that we do or attempt to do in the flesh. The flesh wars against the Spirit for the control of the soul in order to fulfill the lust of the flesh, the lust of the eyes, and the pride of life (1 John 2:16). What I have just described constitutes what I call the “basic need model” and it provides the psychological basis for Faith Therapy. How are Psychological Symptoms Related to Root Problems? Just as a doctor tries to determine a medical problem from the symptoms of his patient, the Faith Therapist begins with the symptoms of the problem, which many times are some of the manifestations of the flesh. From these, the counselor determines the function of these manifestations and the lies and misperceptions that underlie them. These lies and misperceptions are indications of the root problem, which is an attempt to meet one or more basic needs through the flesh. Underneath these is the true cause—a lack of faith in God to meet the client’s needs. Once a hypothesis concerning the root problem is determined and verified, biblical principles are applied to replace the lies with the truth of the Word of God and to change the way the client perceives the problem. In complex problems, applicable biblical models are identified and used to guide the course of the therapy. The goal is to remove the blockage to the process of salvation or wholeness, and to build the faith of the client in order to overcome the root cause of the problem. What Are the Primary Areas of Application? Faith Therapy provides for the integration of Christian counseling within the framework of the process of salvation by faith and for the direct application of faith to resolve deeply rooted psychological and spiritual problems. This direct application of faith is especially effective in treating fears, anxiety, insecurity and stress. It specifically leads the client to accept Christ as Savior and Lord, and addresses problems that arise out of selfish attempts to meet the core psychological needs of love, security, worth, and significance through the flesh. However, through the application of counseling models and the development of counseling plans based on biblical principles, it is effective in addressing all spiritual and psychological problems. What Resources are available About Faith Therapy? The four books listed on this page provide the text books for the basic courses in Faith Therapy. A list of the chapters and an abbreviated text from each book is presented on the Answers by Topic pages of this website. Additional video classes provide more detailed information on these books and critical counseling and life coaching subjects. Additional courses are designed to address specific counseling areas in more depth: Effective Counseling and Coaching Skills, Marriage and Family Counseling, Codependency, Addictions, and Anger management, Domestic Violence, and Sexual Abuse, Facilitating Support Groups, Mentoring and Life Coaching, Evangelism and Spiritual Issue, the New Covenant, Practice Management, and using DSM IV to assess and treat mental disorders. One of our goals is that the material we and other biblically based Christian counselors have developed be used and distributed as widely as possible. Therefore, we now offer the curriculum we use at Word of Life Counseling Training Institute to anyone that would like to use it to start their own church or college-based program. This college curriculum includes a two year plan, course sequences, video courses, syllabuses, assignments, and final exams. This is the curriculum used on our website www.freechristiancounselingtraining.com under the college degree button. Because our materials are so biblically based, this curriculum is earily used in Bible Colleges and for Church-based programs. All you really need is someone to show the videos, lead discussions, grade papers and give the tests. We can even provide supervision for the practicum courses if you cannot find a biblically-based counselor in your area to do this. A total of 15 courses are currently available on DVDs, video files, and MP3s on our Bookstore pages. The contents of each DVD and video course may be viewed either via the hyperlinks on the Bookstore page or directly on our training website by selecting the Free Video Training link at the top of this page. Training courses, certifications, and Bachelor's and Master's degrees from LOGOS Christian College and Graduate School using this Faith Therapy methodology are also available on this Word of Life Counseling Training Institute website.Faith Therapy is also used by Life Christian University as the basis of their counseling curriculum at their main location and at a number of their extension campuses. Their website is www.lcus.edu. Understanding Salvation by faith and resolving deeply-rooted problemsModels for overcoming life's most complex and difficult problems. This book provides a detailed narrative counseling methodology and in-depth answers for counseling many of the most difficult and complex problems found in the church today through a types and shadows analysis of well-known Bible stories. It provides a new ten-step method for biblical counseling based on the story of the exodus of the Israelites from Egypt. It includes in-depth models for overcoming feelings of inferiority, feelings of abandonment, a chaotic life, being a "good girl," dependent rescuing, dysfunctional families, problems with children, injustice, chronic failure, workaholism, irresponsibility, victim mentality, abusive behavior, abuse, chemical and sexual addictions, eating addictions, homosexuality, bitterness, depression, grief, and feeling suicidal. An in-depth understanding of the 8 steps of spiritual growth and how to grow to spiritual maturity This book provides a roadmap to spiritual and psychological maturity based on new personal revelations concerning the character of God and an understanding of the eight steps in the process of salvation by faith listed in Second Peter Chapter 1. This material includes a summary of biblical growth models and Old and New Testament revelations of the character of God, a comprehensive explanation of each of the eight steps, and a biblical character model explaining how each is to be achieved. Finally, it suggests a cyclical path in the spiritual growth process that leads to each new revelation and a methodology for counseling others to grow spiritually and psychologically toward maturity. It is also provides an excellent resource for biblical coaching or mentoring. Using biblical principles to resolve psychological problems not directly addressed in the Bible. This book explains 44 of the most important principles in the Bible from a psychological perspective and provides an in-depth method for developing counseling plans using biblical principles based on Proverbs Chapter 3. It includes a discussion of 13 classical methods of biblical change, a new model for understanding the human heart called "The Train of Psychological Wholeness," and techniques for applying biblical principles in counseling. Finally, it develops counseling plans for problems not directly addressed in the Bible including anxiety, panic attacks, obsessions, compulsions, sexual abuse, domestic violence, marital problems, and Borderline Personality Disorder. You may purchase these books through Amazon.com by selecting the book below. By purchasing books through this website at Amazon.com you are also supporting this ministry. Faith Therapy was developed and implemented over the last fifteen years at Word of Life Counseling Center and Word of Life Counseling Training Institute as God provided a deeper psychological understanding of the process of salvation by faith, biblical counseling and life coaching models, and methods for using biblical principles. We do not claim to have all the answers but continue to develop what God has revealed to us in the quest for a more effective, in-depth, biblically-based methodology. *If you would like to receive a Certificate of Completion from In His Hands International Bible College, we ask that you send a donation of any amount to support Hope's House Kenya and Hope and Light Academy, our orphanage and school in Kitale, Kenya (students from third world nations or anyone in financial need does not need to donate, but we appreciate your prayers, which are worth far more than gold), as well as e-mail a 2-page essay explaining what you learned with at least 3 Bible references to inhishandsbiblecollege@gmail.com ("Faith Therapy" as the subject).